The National Laboratory Association – South Africa is taking the opportunity of informing its membership and all its associates of a very interesting opportunity which is being offered by Seeding Labs. This US based non-govermental organisation seeks to make a difference in the area of scientific research being conducted at universities. Their Laboratory Access program is key to enabling scientists at low and middle income universities the opportunity of obtaining laboratory equipment which is often a barrier to key research work being done. A call for applications was made in May 2018 and for further details, as well as how to apply, can be found here. Closing date for this round of applications is 27th July 2018 and a further round will run from September 2018 to February 2019. The National Laboratory Association – South Africa is very pleased to advise all members that the latest version of ISO/IEC 17025 General requirements for the competence of testing and calibration laboratories has now been published as a South African National Standard. 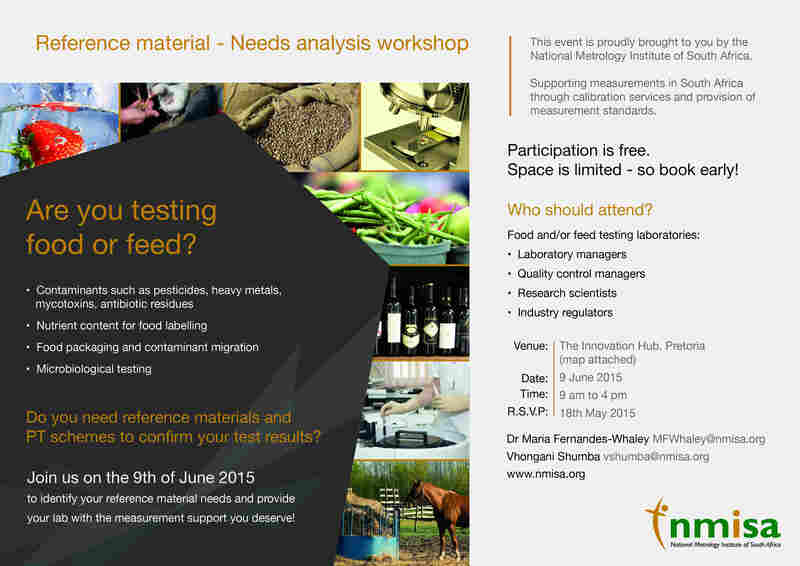 The National Laboratory Association – South Africa is pleased to advise all those who have an interest in Food Testing and related issues that the National Metrology Institute South Africa (NMISA) will be hosting the following workshop. Further details, including registering for the event can be found by clicking on the image below. The updated programme for the week can be found here. The National Laboratory Association – South Africa (NLA-SA) is pleased to advise readers that the National Metrology Institute of South Africa (NMISA) will conducting a Pesticides in Fruit Proficiency Scheme during 2018. Should you be interested in participating you can find the protocol as well as all the details, including the costs, by clicking on the following link. The National Laboratory Association – South Africa was extremely pleased to host a very informative day’s symposium at which some of the world’s experts on measurement uncertainty presented both an update on the direction and development of the GUM, as well as some other very interesting related topics. It is not often that such highly qualified experts visit South Africa and those attending were provided with an unique opportunity to interact these experts as well as to network with colleagues from the local testing and calibration community. The presentations have zipped into one file and made can be downloaded from this link. The NLA-SA would like to thank all concerned and hope to run similar events in the future. On Thursday the 17th, September 2015 an extremely successful morning was hosted by the NLA-SA at which the NMISA (National Metrology Institute of South Africa) Gas Flow Lab, headed by Eddie Tarnow explained what are the requirements to establish a commercial gas flow laboratory. This initiative was specially aimed at the requirements for calibrating “bubble flow” meters which are typically used in the fields of Occupational Health and Hygiene area as well as in Ambient Air and Stack Emission applications. Given the current backlog being experienced by those requiring an accredited calibration, and NMISA being the only lab capable of doing this work, they took the initiative of presenting what the the requirements are to a very interested audience of about 35 people. As a result a number of SANAS Accredited Labs showed interest in availing themselves of this opportunity. For those that missed the workshop the Powerpoint slides from the presentation are available for download here. NB: Further to the post on the 18th July 2015 . 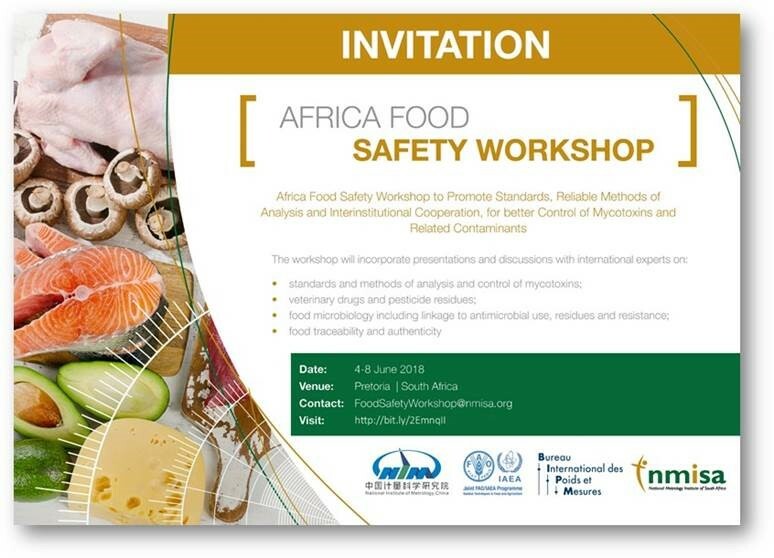 Please note; the date for this workshop has been moved to the 17 September 2015. The National Laboratory Association – South Africa (NLA-SA) is pleased to advise that it will be hosting a workshop on behalf of the National Metrology Institute of South Africa on the 17th September 2015 which may be of interest to all calibration laboratories, especially those who are SANAS accredited and would like to consider increasing the scope of work that they currently offer to the marketplace. Further information can be found by downloading the invitation and all those interested in attending are requested to RSVP to the NLA-SA indicating the number who will be attending. The National Laboratory Association – South Africa (NLA-SA) is pleased to advise that it will be hosting a workshop on behalf of the National Metrology Institute of South Africa on the 1st September 2015 which may be of interest to all calibration laboratories, especially those who are SANAS accredited and would like to consider increasing the scope of work that they currently offer to the marketplace. The National Laboratory Association – SA is extremely pleased to announce the availability of a new service for laboratories and laboratory personnel. For many years the NLA-SA has been requested by many of those involved in both Testing as well as Calibration Laboratories to provide an easy to use mechanism to match those seeking employment and those companies/organisations looking to fill positions. The NLA-SA web site has a menu option marked “Job Opportunities” from which both Positions being offered, as well as CV’s of those seeking employment can be viewed and submitted. Currently there will be no charge for using the system and after recently going live, we would like to encourage use of this facility. NB: Please note that the responsibility for all current legal requirements as far as employment is concerned, lies with users, and the NLA-SA will take NO responsibility for the information provided or its ultimate use. The NMISA is hosting a needs analysis workshop in order to help it establish and prioritize its development of Reference Materials for Food and Feed testing.